Trinity War gets its official start in Justice League #22, in which we see battle lines drawn as two of the three teams start with a face-off that takes readers into the fictional city of Kahndaq, Africa. Opening with an eerie tone, we first see a random woman seeking out the advice of DC’s most prominent mage, Madame Xanadu. 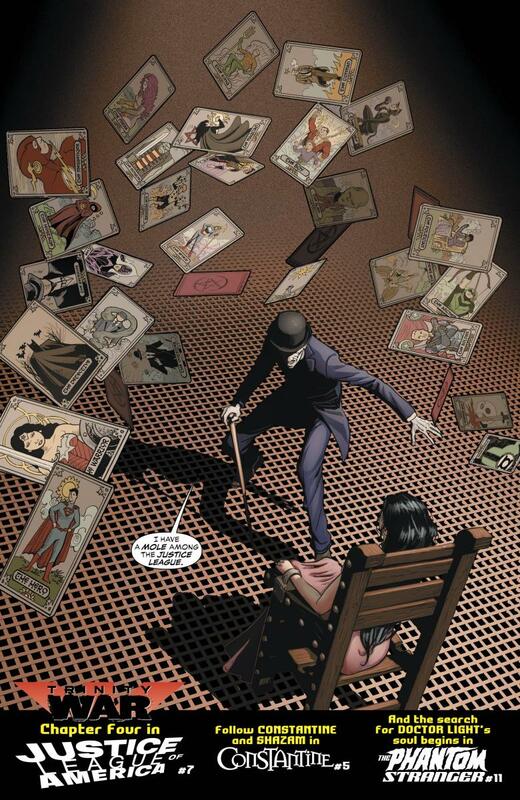 In her last appearance in Justice League Dark, Madame Xanadu made what appeared to be a departure from the team, like many of the revolving-door characters before her. Setting precedence over the rest of the issue, we see a new vision that doesn’t relate to the customer in question, but instead foretells of impending doom that will spread all across the DC Universe, complete with burning cities and disillusioned heroes muttering of things to come. That’s usually how these things go and, frankly, most readers welcome the chaos. These are super heroes, after all. As predicted, by both Madame Xanadu and myself in my review of Trinity of Sin: Pandora, Shazam is a central character of conflict that brings together the Justice League and the Justice League of America. 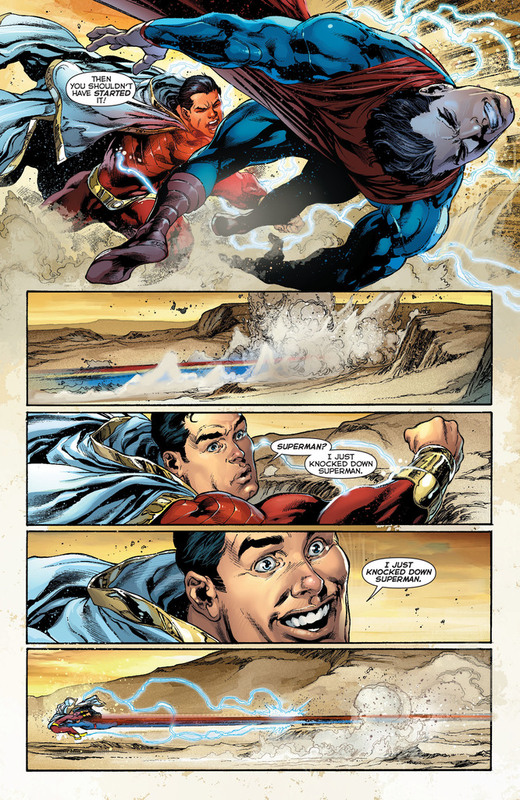 After his battle with Black Adam, Billy Batson (Shazam’s alter ego) feels the need to scatter Black Adam’s ashes over the desert for reasons of sentiment. Against the wishes of the other homeless youth with whom he’s been hanging out, he takes off to complete his funereal mission, stating that if Superman and Wonder Woman can fly into Kahndaq, then so can he. Taking that segue as our next cue, we catch up with Wonder Woman and Superman, who have been dating throughout their run in the New 52. Their “getting to know you” quality time seems to consist of conversations about whether or not to kill when it comes to their respective villains. To paraphrase Wonder Woman, she feels that when it comes to villains they should be taken care of. The date talk is clipped short when Pandora (bearing a striking resemblance to Jim Lee’s Zealot) shows up requesting that Superman be the hero that puts the seven deadly sins back in the three-eyed gold skull from whence they came. She sees Superman as endowed with the purity of heart that could be strong enough to capture said sins. Turns out, not even the Man of Steel has enough gold in his heart to avoid the less savory sides of humanity, even when this “man” is an alien. The issue then cuts to Amanda Waller, most known for assembling the Suicide Squad and for forming the Justice League of America. She is working with Steve Trevor, who has really transcended his “Mr. Wonder Woman” origin. Waller and Trevor have convened the JLA to investigate the Justice League’s sudden interest in Shazam and his “no big deal” border crossing into the “no-no” area of Kahndaq. 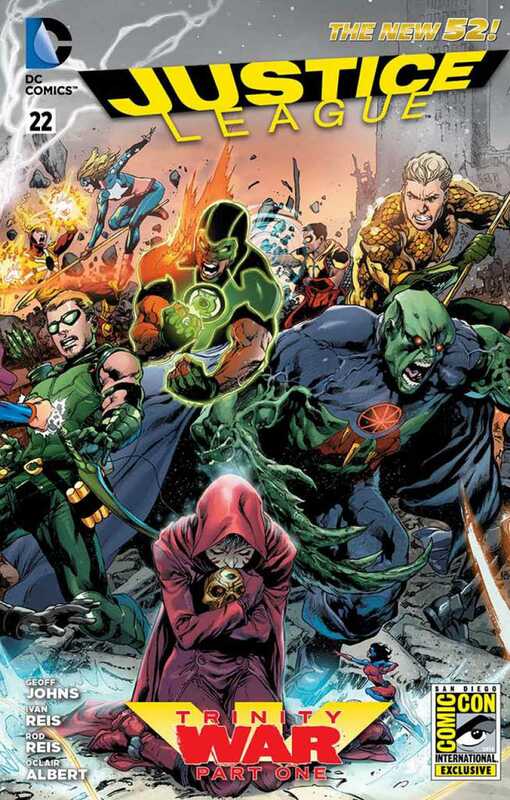 The JLA are each assigned a different member of the Justice League to take care of if a fight should ensue. The JLA’s whole purpose is to be a watchdog over the Justice League, so it’s a given that things are heading toward a standoff. The action picks up as Superman and Shazam duke it out in a slugfest of similar black-haired, caped heroes. The fight comes to a halt when the JLA arrives with the light-manipulating Doctor Light, who has been contracted by Washington to help the JLA. Wonder Woman pays the price when Doctor Light absorbs a little too much of Superman’s power, loses control, and stuns her. In a fit of rage, Superman uses his heat vision to do a little face-melting on Doctor Light. The issue climaxes with the Justice League and the JLA exchanging some heavy-duty punches. In addition, forces both serene and sinister are watching the events unfold. Madame Xanadu’s random customer isn’t so random, as much as she’s a calculating force of evil who blows up the shop—with Xanadu still inside it. 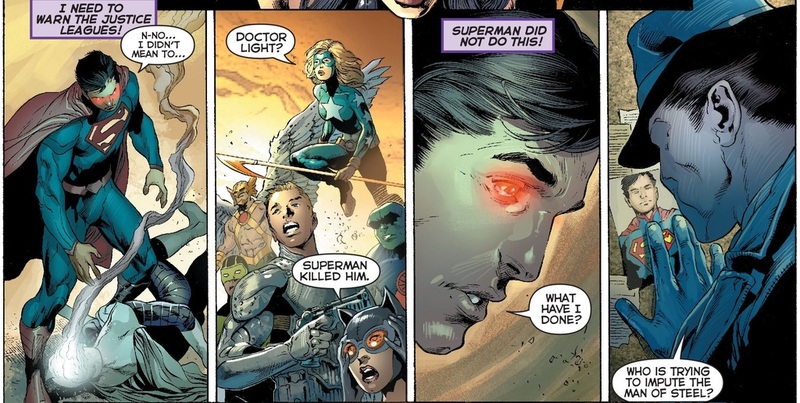 The Question, one of the “sinners” who was punished along with Pandora, has been monitoring all our heroes and pops up briefly, all of which leads back to Superman. A pulse-pounding ride that doesn’t give the reader much time to slow down, this first issue already sets up the next with Doctor Light, the Question, and the shadowy Outsider (Oh my!). Team books with ever-changing rosters can be exhausting, and large crossover mini-series like Trinity War aim to give readers a bigger slice of action, story, and more characters in the mix. Indeed, at times I found it hard to grasp all the characters squeezed into this issue. Still, with the fast-paced thrills, the first battle of Trinity War is off to a good start. Madame Xanadu is a great anchor for the DCU. Her visions serve as a good way to cover a lot of ground. I don’t think she’s the best character for combat since her powers are more passive, but seeing as she’s immortal, I find it hard to believe a simple explosion could kill her. Aside from Madame Xanadu, Zatanna is the only member of Justice League Dark to show up in this issue, but her allegiance seems to be more with her former alumni in the Justice League. Sensing a familiar presence in Shazam’s magic, she may be the perfect glue between all three teams now that Madame Xanadu is kaput (for now, at least). I have to say that a good team squabble makes for a good read, mostly because all the characters are familiar. It’s kind of like watching the A group (Justice League) go up against the band and student council (JLA) while the techies and misfits get in their say as well (Justice League Dark). Wonder Woman is a bit of a hard soul, Superman’s dark side makes for a fun exploration, Catwoman as a team player offers a reverse experience, and I’m happy to see Shazam in any form (here’s hoping he remains a major player instead of just a catalyst to get the teams fighting). The issue made good use of the JLA, who seem to be the most useless team in the DCU thus far. Plus, the way the different JLA members try to swap which member of the Justice League to whom they’ve been assigned was a little stroke of genius, as it showed the point that not all heroes are created equally. The two teams are kind of like insurance coverage versus the free clinic: You have your privatized heroes (Justice League) and your state-sponsored heroes (JLA). In the JLA’s defense, especially considering I’m the least familiar and the most critical of them, I find that they are the ones I’m most interested in learning more about. Fortunately for both readers and myself, chapter 2 of Trinity War continues in Justice League of America #6.